Whether you need craft room ideas or a space for odds and ends, these Magnificent Magnetic Pockets are for you. One Magnificent Magnetic Pocket acts as a tiny DIY organizer, easily suspended on a magnetic surface and ready to store anything. 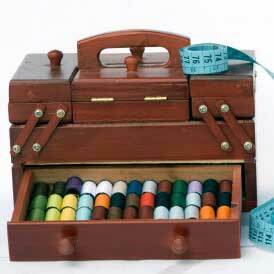 If you want to try this DIY organizer for your sewing room it can keep pins and needles safely out of harm's way. Do-it-yourself home decorating doesn't have to be complicated, make these pockets in minutes and hang them anywhere you like. I love this idea. Having magnetic pockets to park on the refrig is a perfect solution to organizing visual clutter. Pockets could be personalized so every family member could have their own. Great way to leave notes like a doctors appointment reminder or a honey-do list too. I will have to make several. This magnrtic pocket tutorial deserves recognition, fabulous idea for organizing. I would like to start now, plan to use flannel.